We all know that the process of moving can be difficult and stressful to your pet. Even animals that love riding in the car can get more and more stressed the further from familiar territory that they get. The problem only begins with the actual trip, however. When they get to the new home, they’ll need to adapt and adjust to their new environment, which can be harder for pets than for people. Keep your four-legged furry family friends happy and safe by following these important tips to help a pet adjust to a new home, and always be patient! When you move, it’s important to do everything you can to help a pet adjust to a new home. The right steps can avoid your pet getting sick, developing physical complications related to stress, or even engaging in rebellious behaviors like urinating in the new home. It requires patience and time, but take it step by step, and things will work out just fine. The key is to keep your pet’s anxiety levels low. This means do not buy them all new dishes, pet beds and toys right out of the gate. It’s far better to stick to the same old beat-up amenities your pet has come to know and love. Unlike people, pets don’t always feel the need for new stuff. Their old stuff has familiar scents and is attractive as their property. Along the same lines, try to set up your home with familiar furniture and the like, to which your pet will be drawn. Introducing them to the new area after you’ve unpacked fills the space with familiarity which will make them feel more secure. If your pet has a schedule (and most do), stick to it. Take them out for a walk at the familiar times. Feed them at the same regular intervals. Do play time when you normally would. The more of a schedule they’ve got, the more familiar and happy they’ll feel. While some pets are insatiably curious, others get overwhelmed by new spaces. Be patient and understand that it’s going to take time. Introduce them to the new space a little at a time, room by room, and be willing to let them spend a few days at a time in a new space before moving to a new one. Before you know it, they’ll be bounding around the new space like they’ve been there all along! In addition, be affectionate with them. Spend time giving them all the love and affection they are used to, and a little more. This will help them to feel safe like it’s okay to be comfortable in their new digs. Of course, getting your pet there can also be a problem. You want the very best possible pet moving service to keep your beloved furry friend safe and secure on the trip from your old home to your new house. 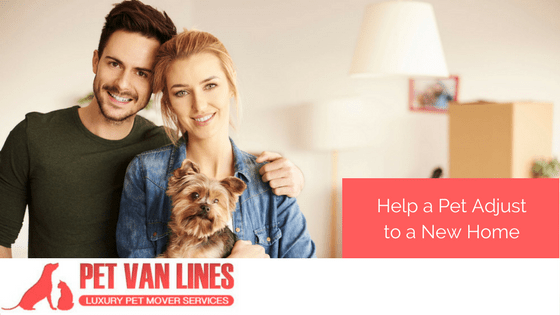 Pet Van Lines has been a premier, compassionate and expert moving service for pets for many years, and we’re ready to get your pet to their new forever home safely. Give us a call to get started today.